Organizations having large influx of documents in their repository often find it easier to reference documents with their unique IDs. Furthermore customers may already have an established ID formats that they use across many applications throughout their organization. This is where the Custom Document IDs feature helps. Every time a document is added to a cabinet, a unique document ID is assigned to it based on custom strings of variables, text and numbers. This unique Document ID follows the document throughout its entire life cycle. Docsvault then automatically increments the numeric counter as each new document is added to the repository. This feature is also important from compliance point of view as unique document identity leads to better security and control over information. Use custom strings of variables, text and numbers for creating IDs. Throughout a document lifecycle, from creation, modification, review, relocation, renaming, etc., a document’s properties change multiple times. This is where unique document ID comes to rescue. Organizations that have multiple documents coming into several cabinets and folders every day need a unique ID that stays constant throughout a document’s lifecycle. This leads to quick retrieval and is even important for better document management and control. Docsvault allows you to create customized Document IDs that can be aligned with your physical filing structure, which gives you a seamless document management experience. 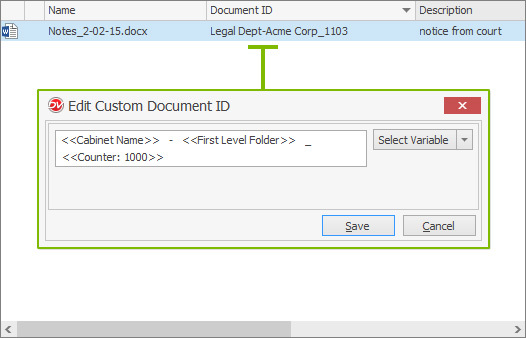 When the Document ID service is enabled for any given cabinet, ‘Document ID’ will replace ‘System ID’ in file lists automatically. Custom reports allow you to gather information instantly for accurate and timely analysis and thus reach decisions faster. As reports are generated in a snap, managers and team members have complete visibility of various progress indicators thus ensuring faster execution times.